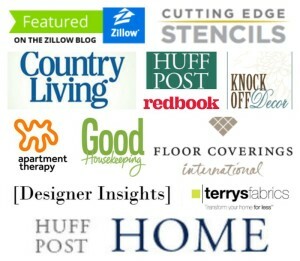 Tired of your old light fixtures? Don’t feel like replacing them? You don’t have to! Paint (and a few other simple products) are your friend here. And guess what? You don’t even have to take them down to update them this way! 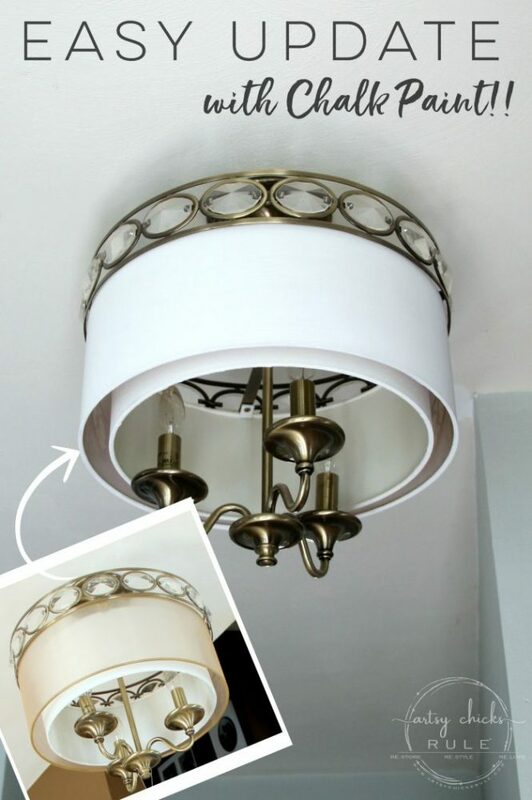 Learn how to paint light fixtures so you can give new life to your lighting, too! 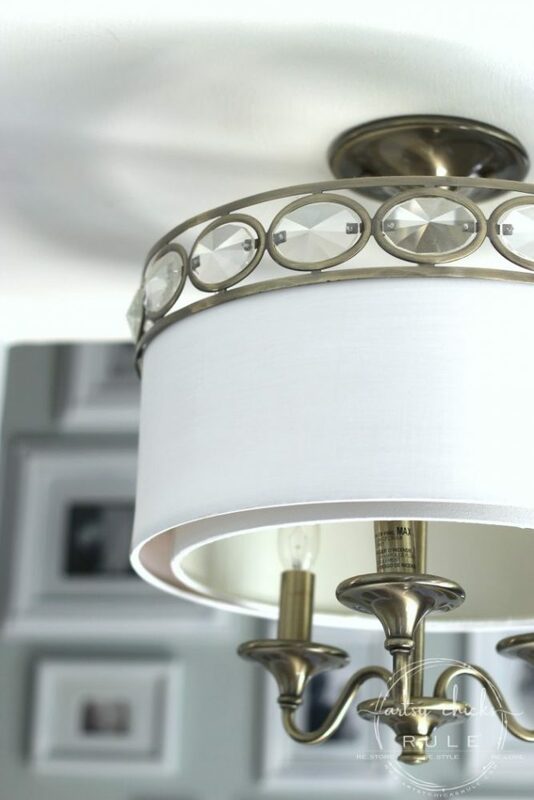 I’m sharing how to paint light fixtures today….and without having to remove them from the ceiling! I don’t know about you, but I grow tired of my decor from time to time. And that would include, of course, light fixtures. As you change your styles, those often need changing, too. 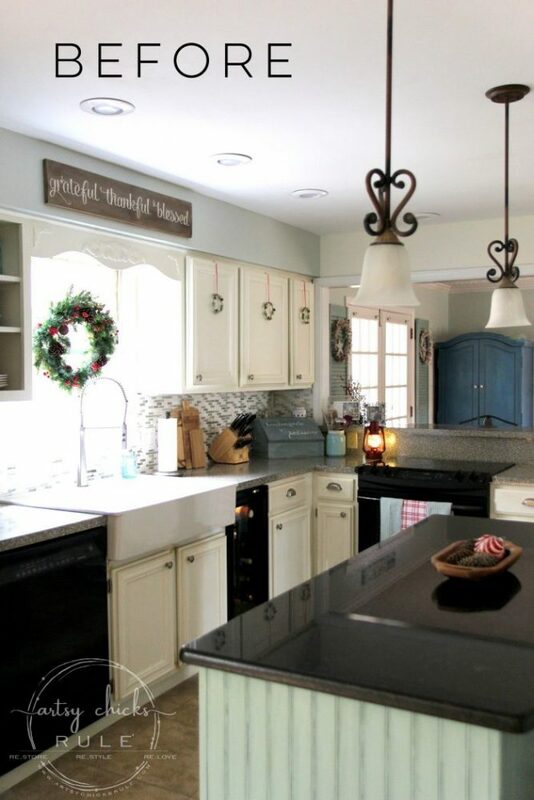 Many times you can just paint those light fixtures instead of replacing them. As you know, we have decided to stay in our home for a few more years instead of selling this year. 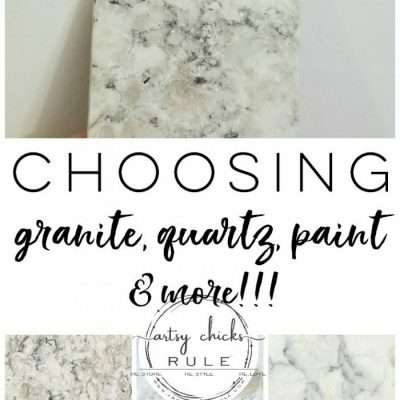 If you want to catch up, I talked about the paint and a few other changes we are making in this post and this post . To be honest, at least 2 of the light fixtures really didn’t match my current decor anyway. I didn’t worry too much because we were planning to move. Since we now aren’t…at the moment anyway…it’s time to do something with them. I really considered replacing them but came up with a few ideas instead. I am SO thrilled to say all 3 worked out very nicely and we saved a bunch by not having to replace them. You want to know the simple trick? Painter’s tape and small artist style paint brushes . 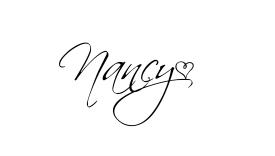 :) Nothing more! But the trick is…….using the proper tools. That’s right. 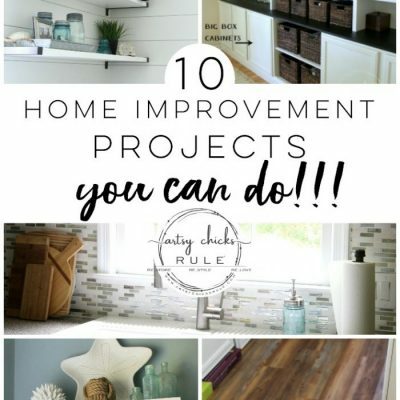 And most projects are just that, all about the using the correct tools. Let’s start with this chandelier in the dining room. I actually tried to update it inexpensively last year with new, white globes. It did make it look a ton better and the globes were not pricey at all. But I still didn’t love it. If you follow along on Instagram, you might have seen a snippet or two (or 5, lol) over the weekend when I was painting/re-doing them. So it’d be fun if you’d follow along! And just take a look at that crispy white ceiling I painted last night. And I honestly don’t think they’ve been painted by anyone in 40 years. So they were long overdue. Just to give you a clue as to how dark and dingy they were…..
I’m hoping that by painting all the ceilings down stairs, it will really brighten up the spaces. 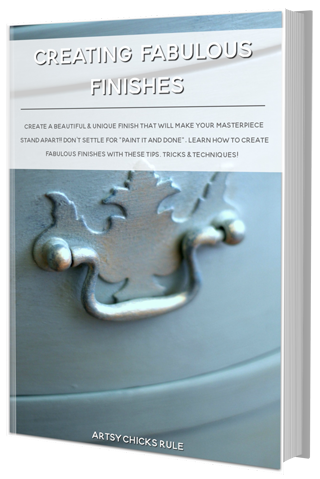 This finish is amazing….and the only one that didn’t get created with PAINT! 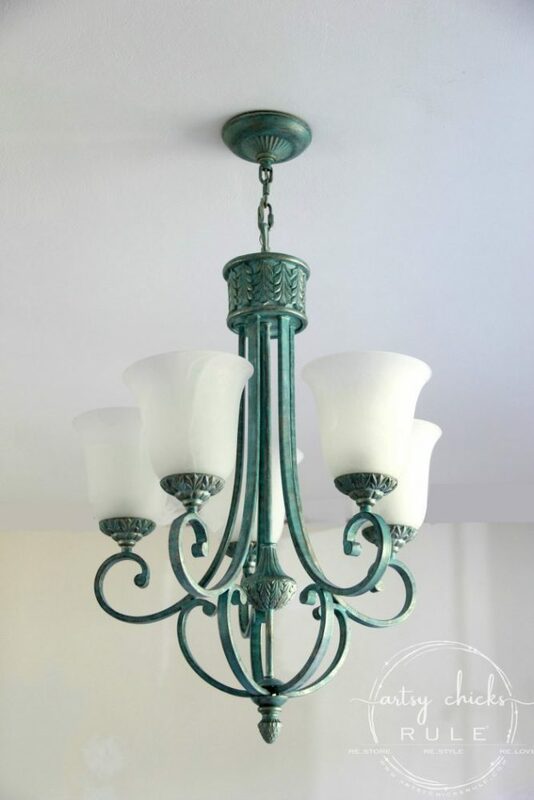 I’ll be back later on with a full tutorial on how to create this “faux” verdigris. I will say, it was oh-so-simple to do. I painted all 3 of these in one day. Not bad, but that bronze is not really matching my style or colors in here anymore. So they got a little paint. And yes, this one got paint. ;) I did these a little differently than I did the chandelier. I just adore how they turned out! The coloring is perfect for the colors in my home. Plus, the aged feel is also a good match for my decor. So happy with them…and I didn’t spend a dime. Every single thing I used, I already had. Love that! And no, I did not have to remove these from the ceiling either. Lastly, the light fixture in the foyer. I recently repainted the foyer in my favorite, SW Sea Salt and it totally changed the feel of the entry. The light fixture, as is, was no longer working. 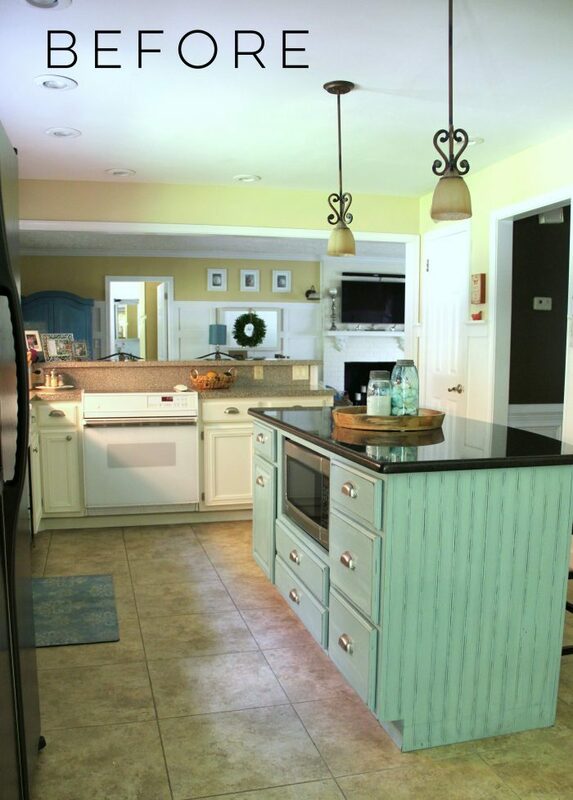 Here it is “before”…(and the old wall paint color)…. And here it is now…. Along with the new wall paint color. You can see a sneak peek of the old gallery wall. ;) It got a little paint too. 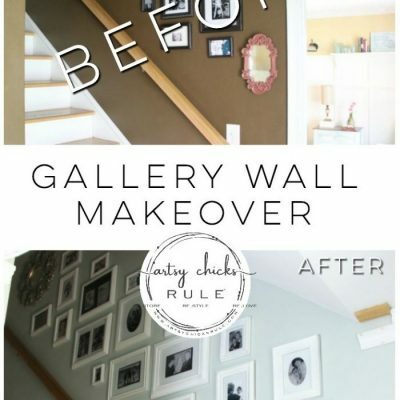 I’ll be sharing the new foyer look once I get it finished. 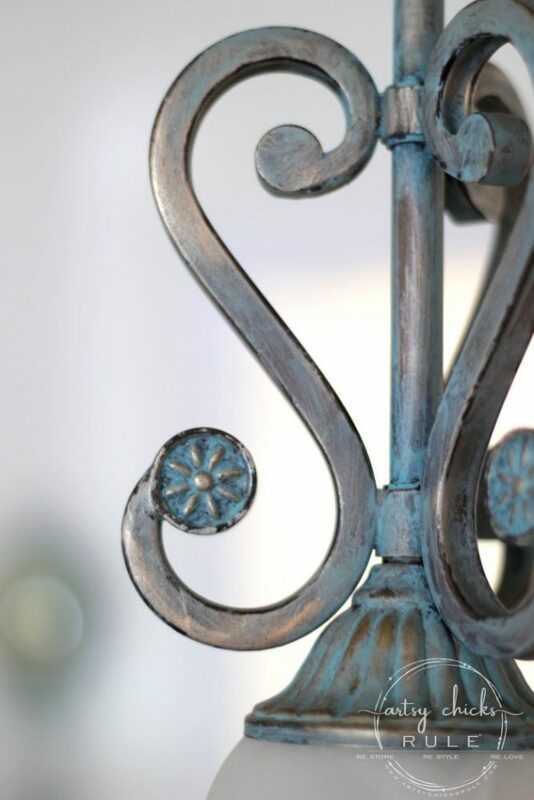 But just look at that fixture…would you ever guess it’s been painted? Isn’t that the best thing ever?! 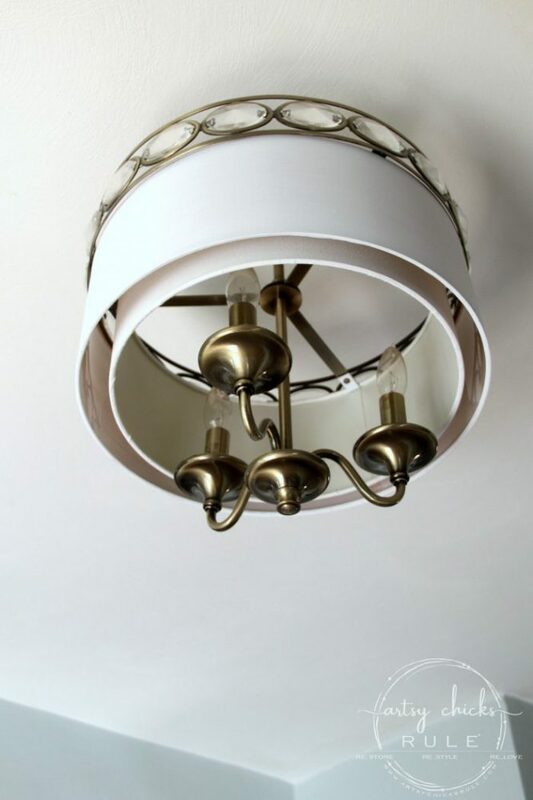 Now, I did have to remove the lamp shades…but the fixture stayed up. 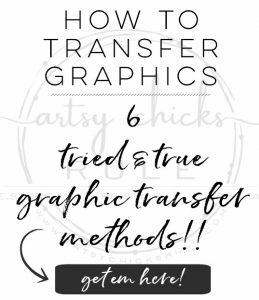 There’s not much to this tutorial because it’s really that simple. The inner shade got one coat of paint and the outer shade got 2 coats of paint. 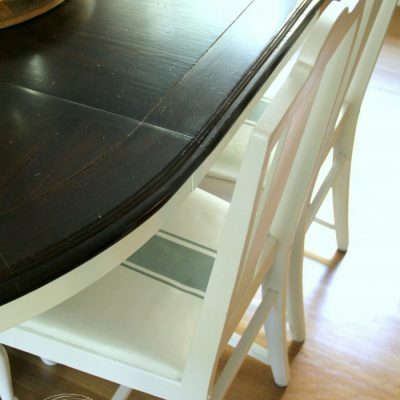 I used this chalk style paint mixed with a tiny bit of water to make it a bit more fluid. You can use a chip brush for this. 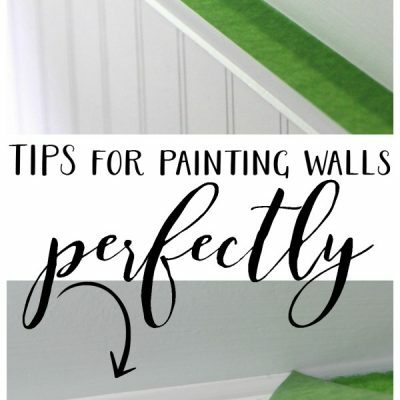 Simply apply the paint either long way around the shade or short, up and down strokes, making your way around the shade. Do make sure your paint is not too thick and try to apply evenly. You want it to “soak in”. Several light coats are better than one heavy one. 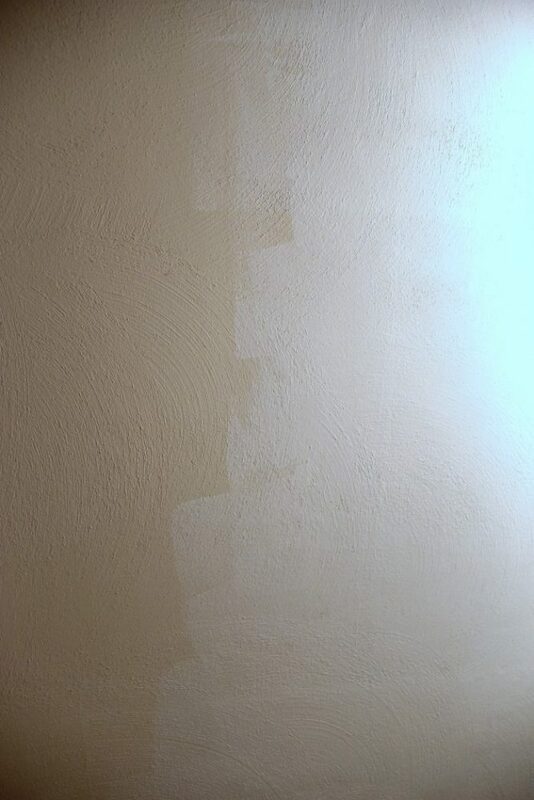 Paint one coat and hold it up to a light to see if you have brush strokes, or any missed spots. I didn’t seal this because I didn’t feel it really needed it since it is up and out of the way. 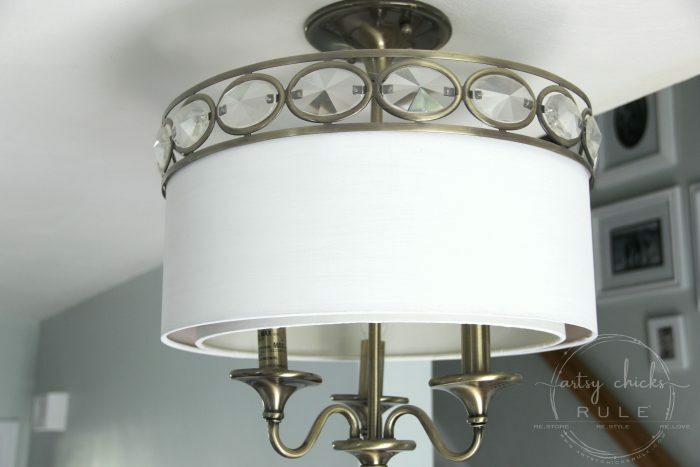 Next week I will share the full tutorials on the other light fixtures I shared today. It would have made this post much too long to include it all here. 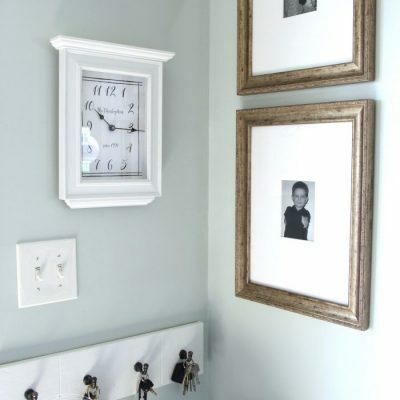 But I did want to include photos of them for inspiration along with the white chalk painted shade tutorial I shared today. 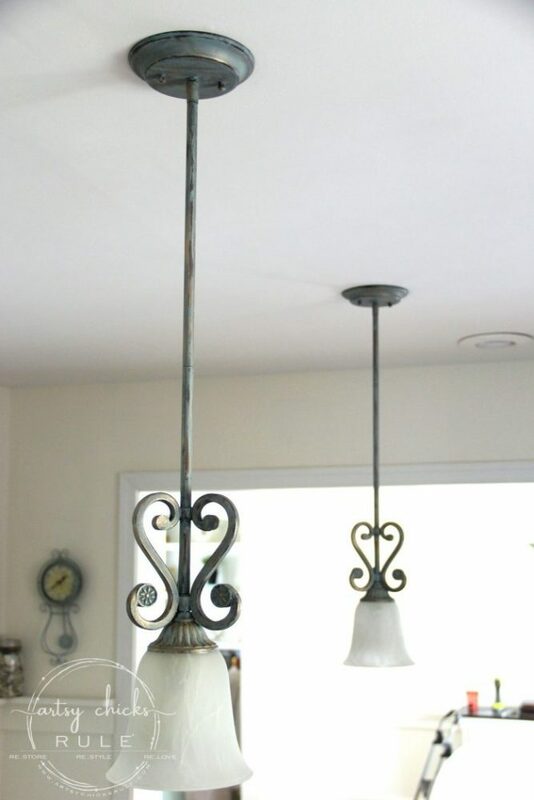 How to paint light fixtures…who knew it was this easy….and budget friendly, too. So by painting all 3 light fixtures (well, 4 in total), we saved a bunch of money (and time and effort) by not replacing. AND….I actually am in love with all of their new looks so it doesn’t even feel like a compromise. 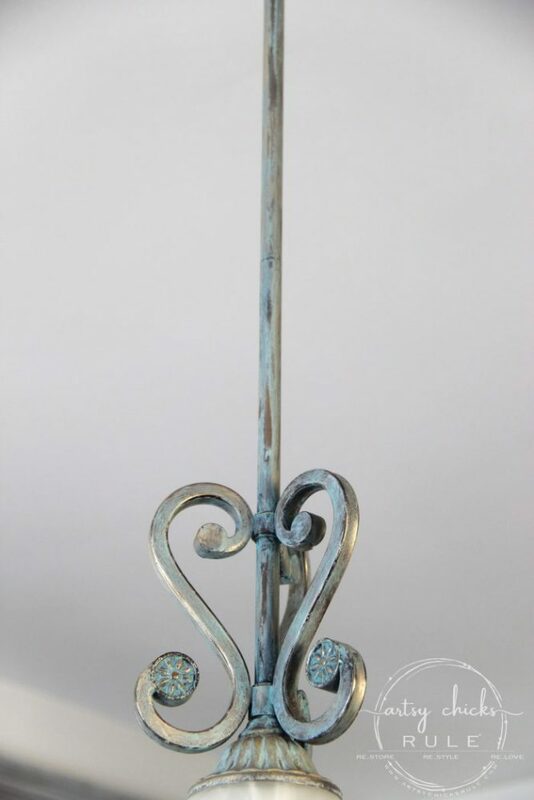 Stay tuned for the upcoming tutorial posts on how I did the verdigris and patina finishes. They are just so beautiful (and truly easy to accomplish). I’ll be sharing them soon! 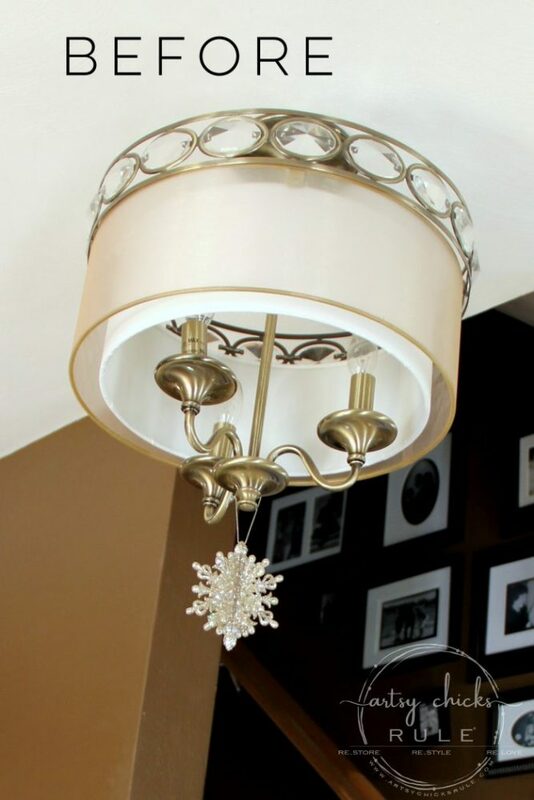 Okay guys, so next time you don’t love your light fixtures, what are you gonna do? 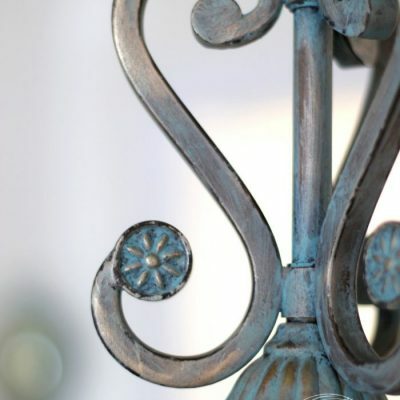 I know we are in the throws of spring fever and I’m talking light fixtures! So, if you are needing a spring fix and missed my other spring posts, you can see them here. 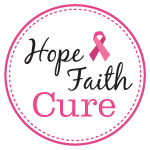 Hope you have a wonderful week, friends! 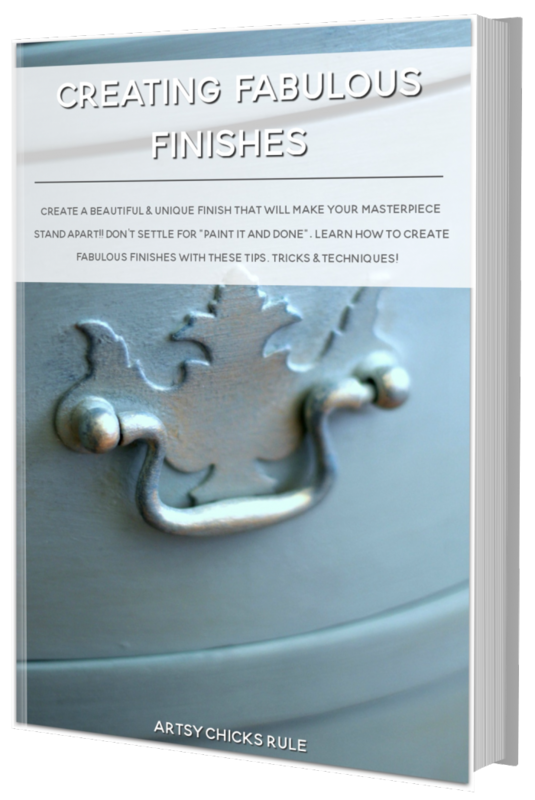 How To Create Faux Patina with Paint…Easy!! 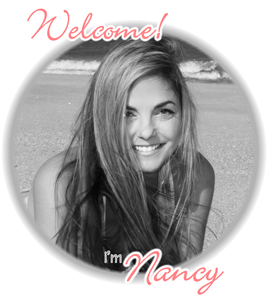 Love your updates Nancy and your ceiling, wow! I’m shocked you didn’t put a patina on the double drum shade chandelier! :) Or maybe not just yet. Your light upgrades are so cool! And so timely! I just scored an old hanging light fixture at the dump that I plan on repainting. I was just going to spray paint it (since it’s not hung), but who knows? Looking forward to the tutorials! Love the transformation! Eagerly awaiting your tutorial. What a gorgeous transformation! Can’t wait for the tutorial. 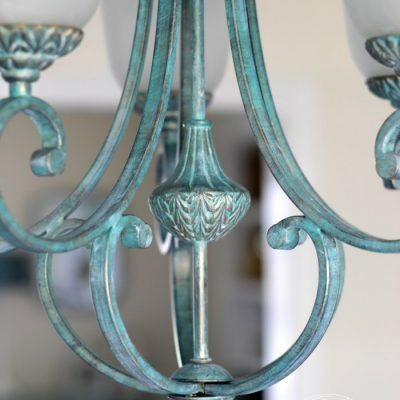 Oh my gosh…I absolutely LOVE the verdigris. Can’t wait to see the tutorial. 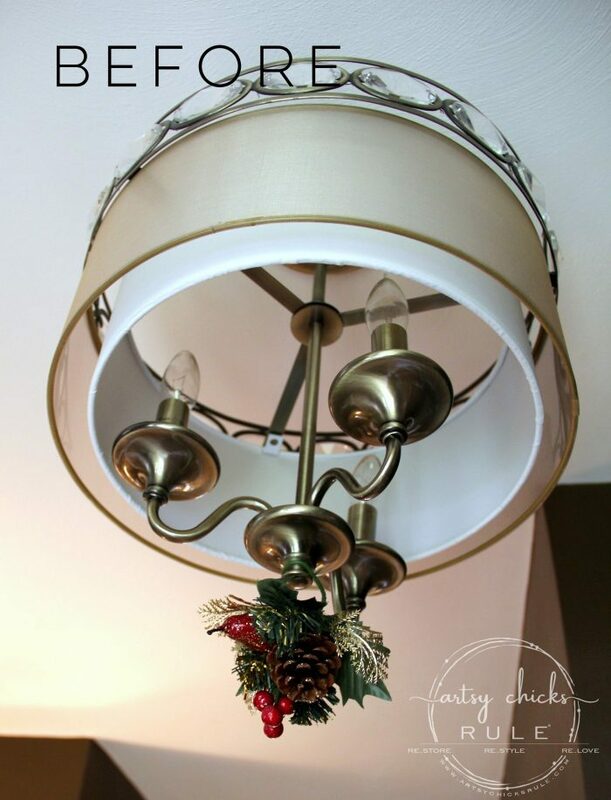 Your light fixtures have so much character now. I absolutely LOVED your lighting updates!! 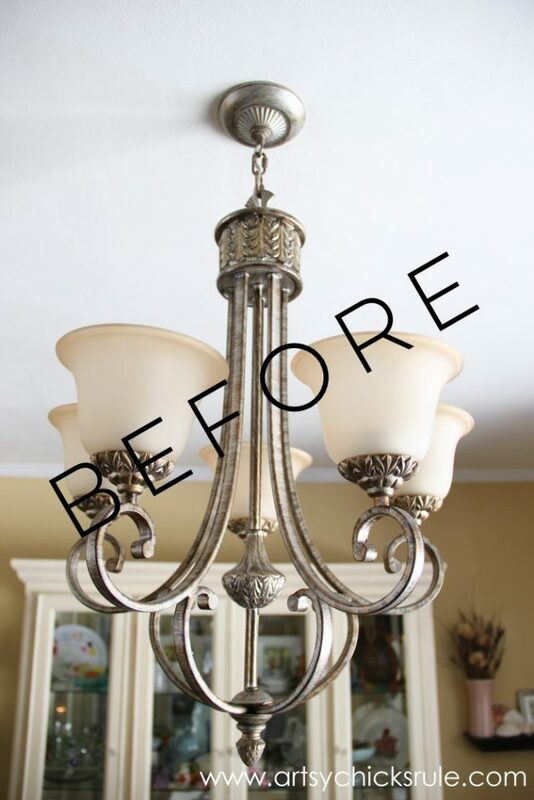 I did a basic graphite chalk paint fix to the old 1941 chandelier in my foyer and to the awful 2003 fixture in my breakfast nook. Amazing how much of a difference a little paint can make ? I can’t wait to see your patina tutorials!! Nice job on all of them!!!!! I like the new finishes on your light fixtures much better. I need to update the one in my dining area, but haven’t decided how. I am into the retro “50s” look so something vintage/modern would work. Any ideas? 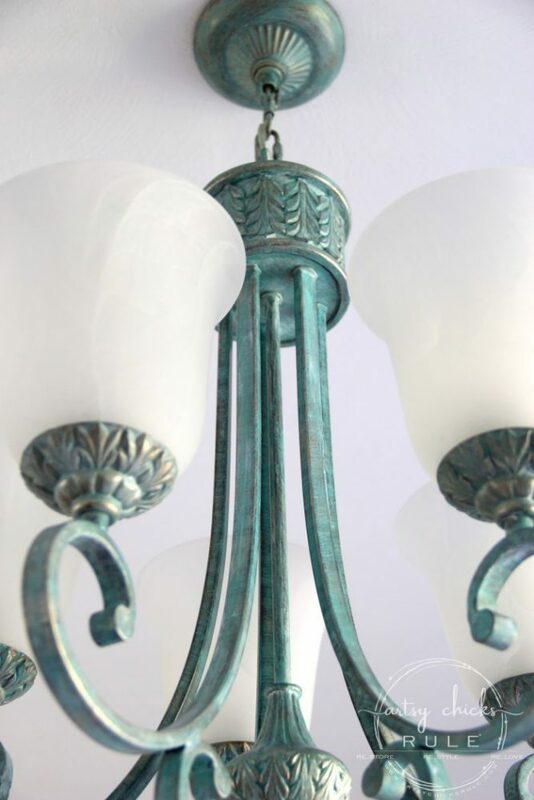 My fixture is nickel with 3 white glass shades. Like you, I’ve thought of just replacing the shades but haven’t tried yet. 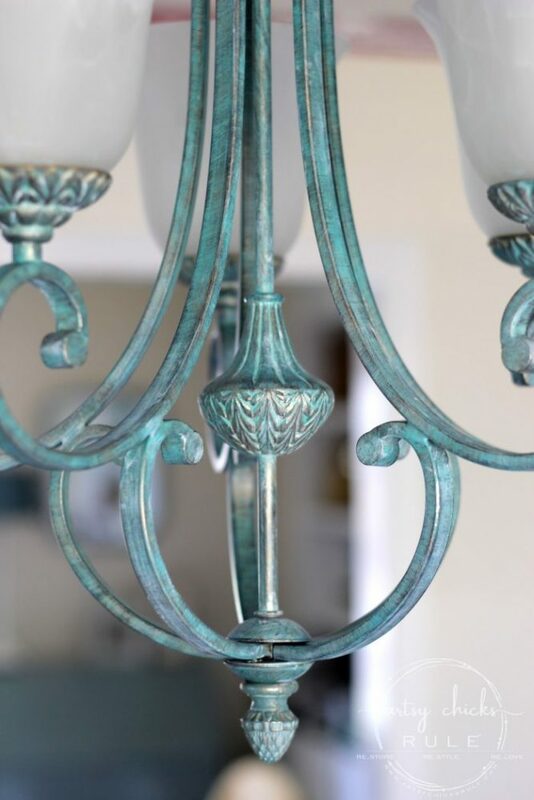 can that same verdigris paint process be done on a ceiling fixture that has moisture in the air due to steam? Hmm, I’m not really 100% sure but it might be okay since the majority of the product is a wax. Is there any way you can test a small area first?